If one link within the EtherChannel bundle fails, traffic previously carried over the failed link is carried over the remaining links within the EtherChannel. Cisco EtherChannel technology is composed of several Fast Ethernet links and is capable of load balancing traffic across those links. Unicast, broadcast, and multicast traffic is evenly distributed across the links, providing higher performance and redundant parallel paths. When a link fails, traffic is redirected to the remaining links within the channel without user intervention and with minimal packet loss. To define the load-balance method, enter in the global configuration mode and use the command “port-channel load-balance ?” to see the load-distribution method available. For the 3550 series switch, when source-MAC address forwarding is used, load distribution based on the source and destination IP address is also enabled for routed IP traffic. 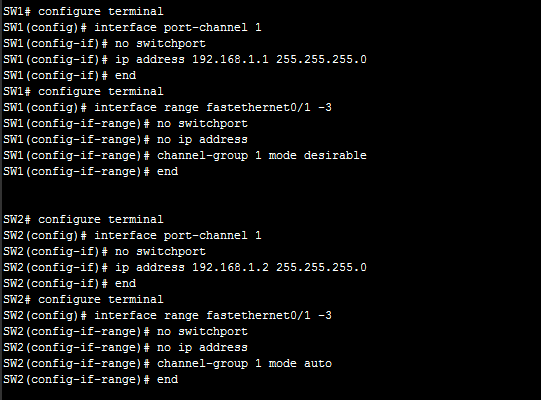 All routed IP traffic chooses a port based on the source and destination IP address. For the 6500 series switches that run Cisco IOS, MPLS layer 2 information can also be used for load balancing MPLS packets. The “no switchport” command is required to change interface from layer2 to layer3 mode.